I also belong to the "Ring of Tatters" and have just received the Autumn Newsletter. 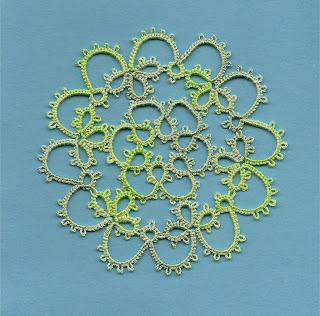 I can recommend the group to all my tatting friends, in the latest issue there are articles by Jane and Linda, plus several interesting patterns and ideas, as well as an article on rings of all kinds. I was trying out some ideas with Sherry's beautiful silk threads...I wanted to make a pattern from Anne Orr with three shuttles, but it didn't work. 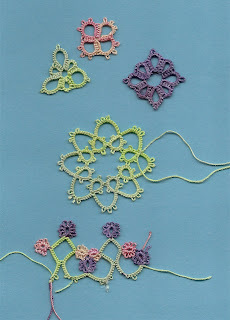 The second row would not lie flat, so I cut it off, and decided to try a simple pattern in one colour from the same book. I also tried some of the simple shuttle motifs from the newsletter. They are designed to be done with two shuttles and linked together with split rings, and are both simple and effective.